Why need to Migrate the network? In my previous post, I've described the problem that we have in our traditional DSLAM network which is the contradiction between Bandwidth vs Distance . It must be highlighted here that our traditional Access Network need to migrate to IP Base architecture. This migration is necessary to accommodate the changing of our technology and to ease the maintenance of the network . A clear Idea can be understand from below diagram. When we connect to internet , This is some of the technologies that were use in the backbone. The migration from traditional network is necessary for us to meet the challenge of future technology expansion and requirement. The world that we live today is becoming smaller and smaller, although I don't like the idea of absolute globalization, but this technologies might help those in need of learning in area that not even possible for us to travel . Just imagine next time we can have realtime meeting with anyone from around the world from the comfort of our own house.I believe this is essence of technology which should make our life easier . Passive Optical Network (PON) and Active Optical Network (AON) is a communication type used to transmit data from one point to many connection. In Telecommunication,this is known as point to multiple points or known as abbreviation P2MP . 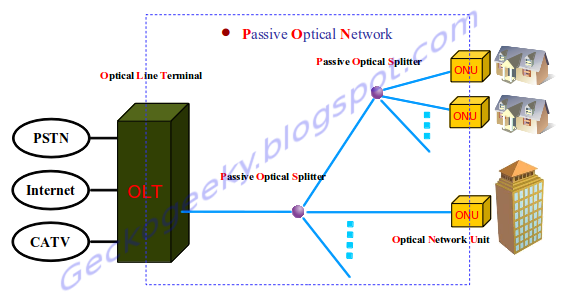 Fiber optics uses light signal to transmit data to its destination.In order for data to successfully transmit to its destination, There are two main concept for this to happen which is Active Optical Network (AON) and Passive Optical Network (PON) . AON uses power switching like switch aggregator to manage the signal distribution. PON on the other hand does not include this power switching but uses passive splitter to transmit data to its destination. Power equipment only needed at the starting and end point within the network.We will have a look on PON later in this post. Since AON is using switch aggregator, the switch open and closes depending on the signal and direct the incoming and outgoing data to it's destination . The data transmission using AON is properly deliver.The disadvantage of running AON is it require active power equipment and need at least one aggregator for every 48 subscriber.With this understanding ,the building cost of installing AON in network is extremely expensive and is not a cost effective especially in delivering in large network. 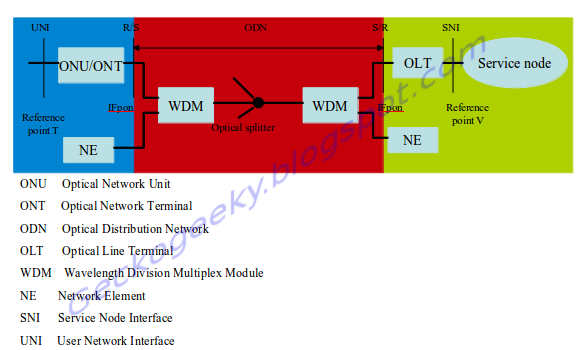 A PON network consists of Optical Line Terminal (OLT), Optical Network Unit (ONU), and Passive Optical Splitter (POS) .Optic Line Terminal (OLT) is the equipment at the central office or service provider location while Optic Network Terminal (ONT) is the power equipment in the customer end . The transmission between the splitter is running using Wave Division Multiplexing (WDM) technologies. Figure 2.3 below show a detail information of a PON Model . OLT is located in service node interface (SNI) while ONT on the other hand is located in User network interface (UNI) in the big picture of PON network . This is so because of the equipment location in the network. OLT is connected to the upper layer of the network and ONT is at the user end premises in the network .More on this later in the next chapter. .
Thats it for now . I'll be discussing more about PON standard next time. Happy blogging! !